This Italian-style braise is great with polenta chips, and is also delicious with a short pasta such as penne or macaroni. 1. Soak porcini mushrooms in boiling water for 20 minutes or until soft. Drain and chop. Slice button and swiss mushrooms. Cut portobello mushrooms in half and slice. 2. Heat half the oil over medium-high heat in a deep, wide saucepan with a tight-fitting lid. Cook the onions with the thyme, pancetta and salt for three minutes then add the mushrooms (except porcini). Cook until all the ingredients turn golden brown. Remove from pan and set aside. 3. Add remaining oil to pan. 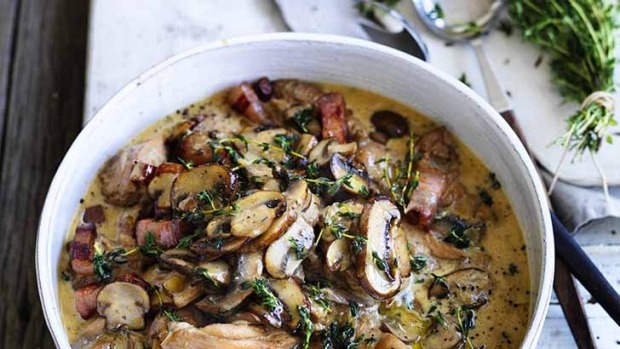 Brown chicken pieces then return mushroom mix to pan. Add the porcini mushrooms, Worcestershire sauce and mustard and cook for one minute. Deglaze with wine, scraping the bottom of the pan with a wooden spoon. Add stock and bring to a boil. Turn the chicken, reduce the heat, and simmer with the lid on for five minutes. 4. Add the cream and continue to simmer until the chicken is tender and the sauce has thickened. Add pepper, check the seasoning, and serve. Serving suggestion: Serve with Neil Perry's polenta chips.